(SPOT.ph) As they say, nothing can replace a classic. And when it comes to classic flavors, nothing beats snacks from your childhood. If you grew up in the '80s and '90s, you’ll no doubt know—and love—these nostalgic treats. You love them so much, you can't get enough of them in 2017! Like most kids, you probably crawled your neighborhood during summers looking for a neighbor who sold these frozen treats. Sure, you could make the things yourself—it’s just powdered juice mixture poured into slender plastic bags—but the hunt was part of the fun of eating ice candy. Nowadays, ice candy has “leveled up,” with buko pandan and fruit salad variants now being sold. Hotdogs with marshmallows were the highlight of every birthday party. Because that’s just how Filipinos throw a kids party. Whether at your shindig or at a friend’s, hotdogs on a stick were always the first handa to run out. There’s just something about the juiciness of the hotdog and the sweetness of the marshmallow that makes this childhood fave so unforgettable. In many ways, this classic snack grew up with us. From being a lunchbox staple, it’s now an ideal match with a cup of coffee. The toasted bread, slathered with butter and sugar, is a filling treat that makes coffee and snack breaks a highlight of your day. And the fact that it’s sold in mini-packs make it a convenient on-the-go snack—perfect for busy people like you. 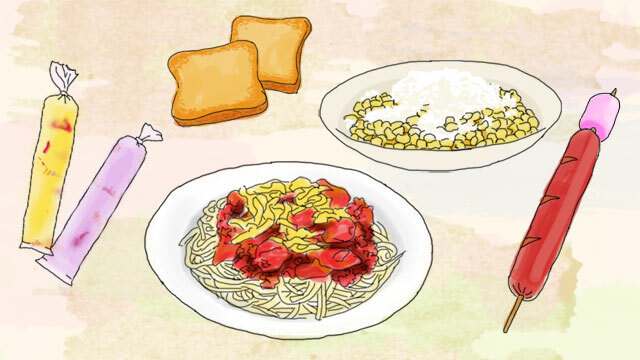 Foreigners will probably gasp when they see Pinoys dump an entire bottle of banana ketchup and heaping cups of sugar into their spaghetti sauce, but that’s just how we like this dish. It’s always a treat when your mom makes this on your birthday or on weekends. And when adulting gets you down, a heaping bowl of Pinoy-style spaghetti never fails to lift your spirits. What’s not to love about binatog? The combination of sweet corn kernels, shredded coconut, sugar, and melted margarine offers an explosion of goodness in your mouth—which is why you were always running out the door when you hear the vendor’s signature bell ringing. Times may change, but our taste buds will never forget the iconic tastes of our childhood. Luckily, many of your favorite snacks are still available, allowing you to rediscover what made you fall in love with them in the first place. Take for example La Pacita PRIMA Toast, which you can get at the nearest supermarket and convenience stores. Bite into the nostalgia as you enjoy its Classic variant, and discover a new favorite when you sample its new Caramel and Sweet flavors. This article was created by Summit Storylabs in partnership with La Pacita.